The New Year had come and gone, so it was time to clean out the middle desk drawer in my kitchen. It’s the one that is home to the calendar that tell us what to do all year. Discarding the old one was easy; tackling the ubiquitous Dominos fliers and carryout menus was not. However, sifting through each scrap of notepaper to determine if it was still relevant was the time-consuming part. I got to the stack of recipes that ended up in the drawer with one swipe of my hand whenever company was coming. I really didn’t know why I had saved most of them. Then I came across this gem and remembered exactly why I had saved it. It was a lie, a bald-faced lie. 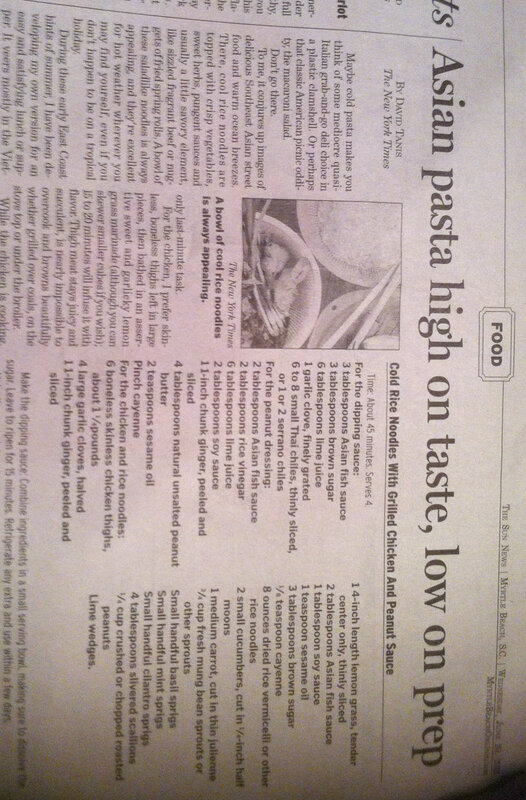 The headline: Asian Pasta, High on Taste, Low on Prep. The recipe: Cold Rice Noodles with Grilled Chicken in Peanut Sauce. There were two long columns of ingredients—36 separate items. All had to be grated, peeled, halved, cut into moons, deboned, julienned, crushed, chopped, or thinly sliced. That was after you managed to corral them all together. Forget about the time grocery shopping. This was low prep? The directions said 45 minutes. Now I’m a fairly decent cook, with modern conveniences. No way could I get all those ingredients ready to stir-fry and cook them in 45 minutes, even with my husband (a very proficient chopper) helping. So what’s the deal? Why are they lying to us?